Welcome To My Gluten Free Website! 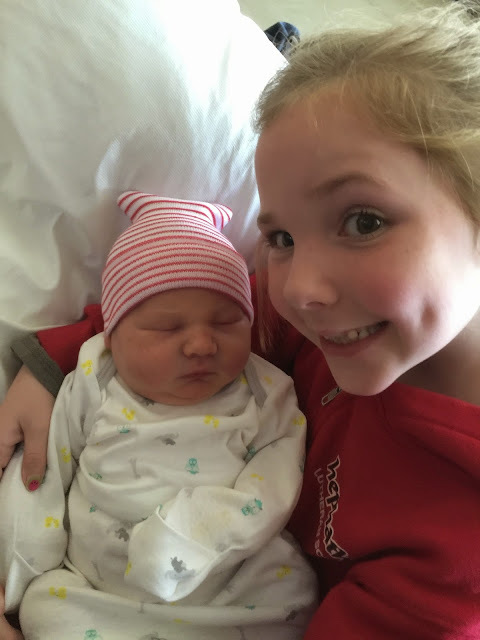 New Christmas grand-baby boy Rowan, with sweet big sister Lela. So yah, it's been awhile since I've had the luxury of writing on my blog. All of my reasons were/are legitimate. My husband and my son were having health issues that just needed to be firmly interacted with on many different levels. So that being said, things picked up to very positive levels starting in the new year for both of them, and me. We even downsized our living quarters from a three bedroom (one bedroom was the catch all for everything!) to a two bedroom in a completely new community. It even has a bigger and up to date kitchen! So that means I can cook in style. I have about triple the counter space, drawers and cupboards with a huge pantry. I can actually have ALL of my equipment and groceries in the same room, not spread out between closets and spaces in a wild variety of places. I no longer have to open a drawer, open the cupboard door directly under it to support the drawer, place a jelly roll pan onto the open drawer, and then place a cookie rack on top of that for cooling the goodies! The problem with this setup however is that if someone came into the kitchen while I was in there working and even "breezed" by these elaborate setups, they could and would disassemble, falling to the floor and loosing everything! Quite frustrating. Picture me screaming into a paper bag! When the weather is cooling off the first thing I think of is, "Yeah! Warm comforting foods!" Meatloaf is one of my families favorite entrees to enjoy. If there's any left it makes for terrific sandwiches. With that in mind and the dilemma of "whats for dinner tonight? ", I couldn't decide between meatloaf with potatoes and carrots or pizza. So I combined the two and came up with these. They turned out so very yummy and fulfilling not only by quantity but by comfort. The dough pockets are are tender and chewy just like the pizza crust, because it's my WOW! Pizza Crust recipe. It's harvest time for apples. Technically it's supposed to be cooling off considerably, weather wise since this is officially "Fall". Unless you live in Southern California! We've had a couple of mid to high 70's the past 7 days or so. Whoopee! The fan is on in our bedroom 365 days a year. Some of our neighbors are still using their air conditioner 24 hours a day and even when our nights are '"frigid" in the 60's. Maybe those still using their a/c's are hoping to provide themselves with a bit of artificial "fall-Like" weather. That actually sounds very reasonable to me. What else can I say except WOW! These are rich with dark chocolate layers, luscious creamy fresh made caramel, and perfect peanut-nougat. Just plain amazing. Unsweetened iced tea is perfect for me along with these cut into 1 inch squares. These yummy morsels are pretty much a coconut macaroon. But a much lighter version. They aren't sooooo sweet that your teeth threaten to fall out with the first bite! When making these I tucked the stragglers on the bottom under to make them look much "neater." Then I forgot while working on the next tray and decided that the bottoms looked like lace once they were finished. And they still tasted amazing! 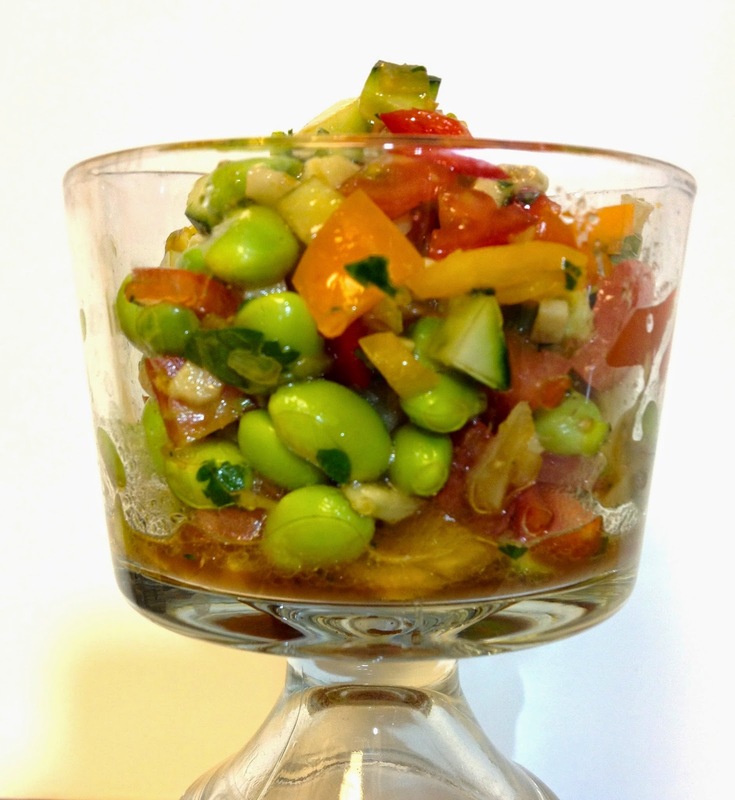 This is a wonderfully light sweet and tangy salad for hot days or nights. It includes pre-cooked and peeled shrimp for a whopping time saver, sweet cold cantaloupe, fresh crunchy English cucumbers, tangelos, cluster tomatoes, three citrus fruits-zest and a slew of flavorful ingredients to cool down with and enjoy. There's a well known restaurant chain here in So Cal that really does great honey wheat-bran muffins. Greg eats one every time we go there which is usually after church. Before I was positively tagged as gluten intolerant I would enjoy a few bites of this muffin as well. And always with disastrous results (if you know what I mean!) Extreme gastric discomfort. 'Nuff said? 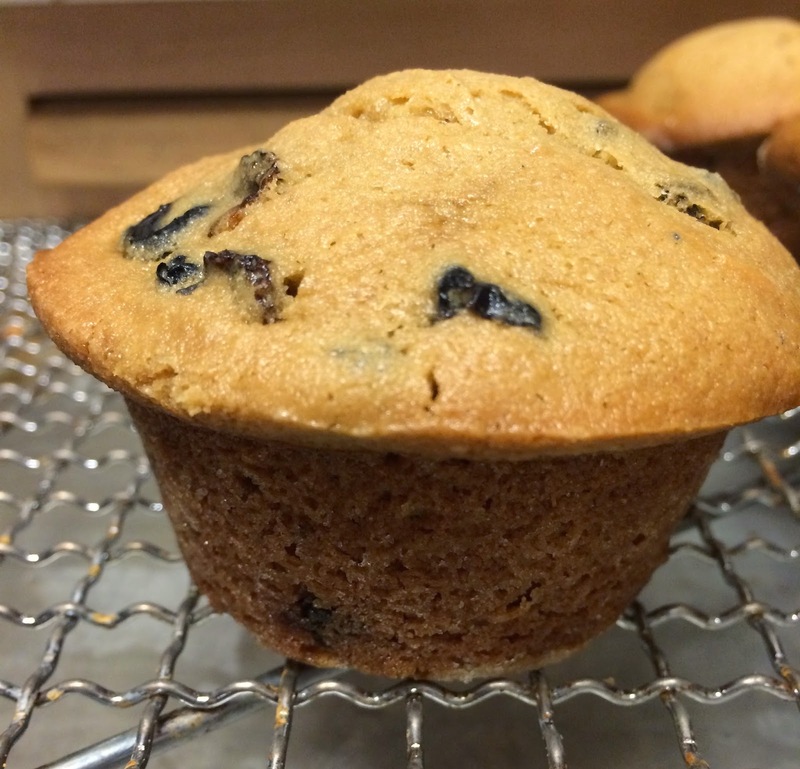 The flavor and texture of those muffins are awesome. Before I had to cut out all gluten I had made a honey wheat-bran muffin to rival theirs. I really thought I was loosing everything by cutting out all gluten. But not any more! I wanted something different to satisfy my sweet tooth today. Something with fruit. Something light. Perusing, perusing.......Vegetarian Times mag for August has some amazing recipes, including a sour cream plum cake. We are so fortunate to have a dear family member named Eileen. She's a CPA and Tax Specialist, and she works very long hours trying to get everybody's everything in a straight line! She has a super sense of humor, is a pretty straight forward Gal that wouldn't think twice about telling one where they needed to head in. We adore her! We had a great time a couple of weeks ago attending a surprise party one of her milestone birthdays. These so deserve an exclamation at the end of the title! They are just the right combination of sweet-tart dried cherries and chunks of fabulously dark Callebaut Belgian chocolate. These pretty much easily shame a well known manufacturer's recipe. Since there are several out there I'll let you guess which one to yourself. The flavor is absolutely superior, they are buttery, just the right amount of sweet, and enhanced even further by the fruit and chocolate additions. I was looking for something tart-sweet, creamy and lemony so I had to put this together. 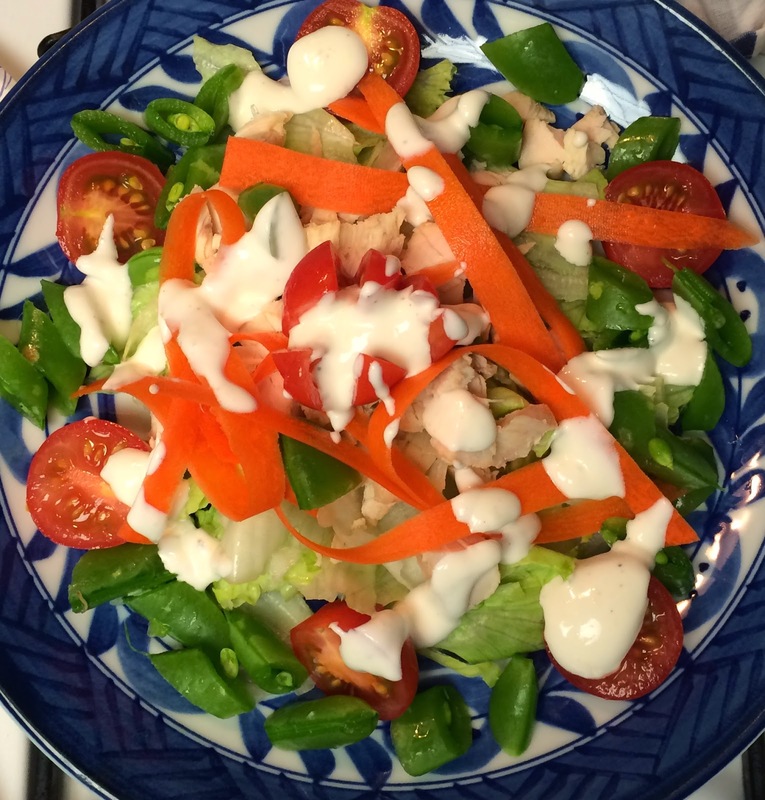 It was absolutely sublime for our simple fresh chicken salad. It has been so sultry lately that cooking and eating something hot was just out of the question. And besides, I was out of luscious Rhubarb Mousse! Yummmmm! This dish can easily replace dinner on those hot nights when cooking just seems like it’s too much bother. It’s so cool and creamy, and just seems to hit the right spot for when you need something delicious, but it’s just to hot to cook! We love barbecuing and grilling. I have a very heavy duty iron grilling pan. It's great for toasting buns for burgers and dogs, vegetables and fruits, and of course all types of meats and seafood. One of it's great features is that it's usable on the stove top. It makes foolproof grilling possible by the simple fact that you can watch it up close. I have a couple different crackle-cookie recipes. Some are quite fickle, but they all taste great. This recipe is not too sweet, a bit rich with a great full chocolate flavor enhanced by the espresso. These are tender, moist and chewy just like our favorite brownies. The recipe doesn’t contain very much flour blend, which doesn’t impede the structure or taste at all. 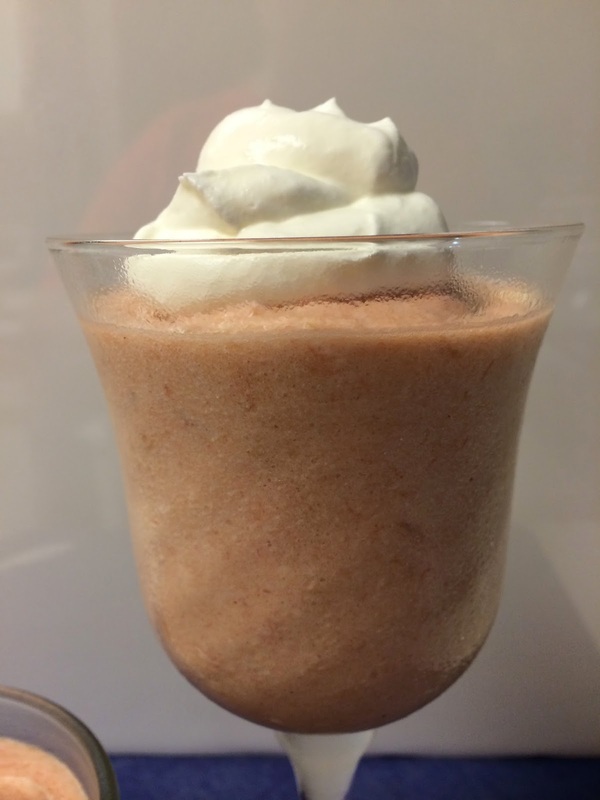 This pudding is naturally Gluten Free! I really liked this GF product. It cooked up well and was a nice addition to the rice. I've making lemon rice pilaf for eons. My kids loved all types of rice dishes and when I needed to be a single Mama with three kiddos, rice was a main meal staple sometimes three times a day. We ate it steamed, boiled, pilaf-ed, usually in a savory manor. Yup. I know that I've already got a waffle recipe, but if we had to make a choice between the two? This would be the one. The first one has flax seeds, this one has psyllium husk powder. Nutrition wise, both the flax and the psyllium are important for your bodies health, but with the flax seeds you need to hydrate them. 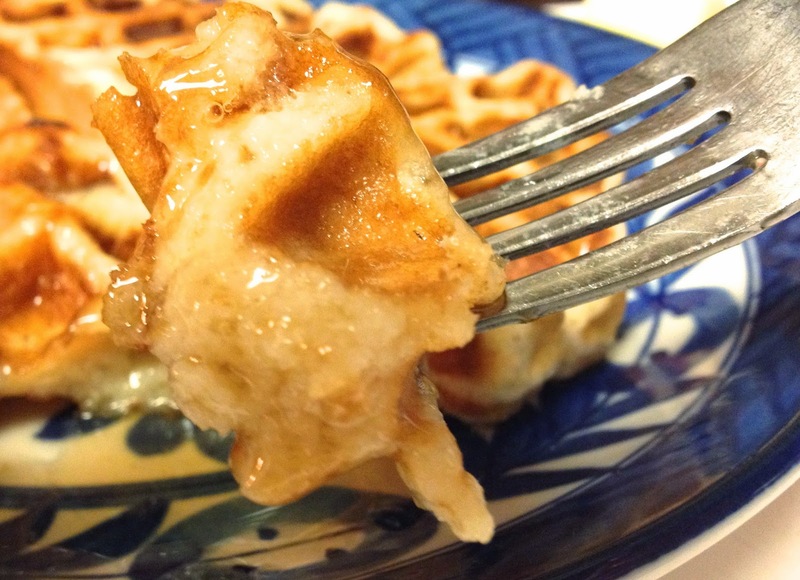 Adding more moisture and humidity can also have a big play in how the waffles come out, quite often they will be gummy despite using the exact same recipe. I was so irritated and annoyed (I really feel those are separate terms! ), that my husband and son were going to eat Lasagne, Stouffer's no less which I think everybody loves. So I got out aaallll of the ingredients to make myself killer mac and cheese. And, as you can see in the photo above it came out perfect, gorgeous and very delicious. My oh my! This lovely breakfast entrée was offered on a menu at a local So Cal restaurant. Of course I wasn't able to order it due to the wheat based English muffin, but I could come home and make it! First I would need to make fabulous gluten free English muffins, which I did, (and was a prior post), and I might add that the entire process was so satisfying. It far outshines a commercial breakfast sandwich that is advertised daily. In fact it kicks it in right in the pan!It took me several days worth of juggling events in my household so I could take the time to make the English muffins. I wanted them to turn out just right. I felt if I couldn't give them my undivided attention they would suffer, and then so would I.
I love, love, lovvvvve great English muffins. Love them. Really. I tried a store bought GF product a while ago and it was inedible as far as I was concerned, it was so dry we could have painted it black and sold it as a premium hockey-puck. Hey! There's an idea, we could make and sell those! No? So I decided to try making them, and I'm so happy with the results! I had bought English muffins rings at Sur la Table, 4 for $6.00. That's it, six bucks. I bought two sets. When I first bought these they were for making hamburger buns. There are several fast food places that have regular wheat English muffins. These would triumph in fragrance, taste, appearance and cost. They are very airy-like an English muffin should be, very, very wonderful taste and the appearance is foolproof! Rhubarb has always been it's own food group to me. I love it made every way possible and the possibilities are absolutely endless. It's packed with vitamin C, antioxidants, as well as oodles of other nutrients and fiber. I love to eat it warm, and topped with a scoop of homemade vanilla-bean ice-cream for dessert or just because at any time of the day, really. I've been making this same recipe for chowder, or "chowdah" if you live in our New England states, for about 40 years. It's very creamy, buttery and perfectly thick, loaded with yummy little clams, tender potatoes, caramelized onions, and some parsley for color and nutrition. Oh, yes, and topped with some crispy bacon pieces. Fabulous. These are favorite "little smackerals" (Winnie The Poohism's) of both of my daughter's and their friends. I even make these for bake sales, catering, gifts...they are a sell out in many, many ways! These are oozing dark chocolate sandwiched between a buttery, lightly sweetened gluten free graham crust and heaping mounds of toasted, tender masrshmallows. Just look at them! How could you not want to just reach right in and get one?! This last week my husband said that he absolutely loved butterscotch pudding. Okay, I like butterscotch as well, so I made 8 ramekins worth. They were "curing" in the fridge in the garage. "Were" of course being the key word. Grilled fruits are such a delicious surprise to serve, and eat. This one has a base of fresh spinach leaves. Then I carefully built up the flavors that would be enhancing or even contrasting with the addition of slightly warm sweet summer peaches by adding sharp tangy flavored green peppers, chunky-sliced endive for color and crunch, Mediterranean herbed and spiced Feta cheese crumbles, sliced raw almonds for crunch, and dried blueberries for a little extra sweetness. Everything was and always needs to be at the peak of freshness for my salads. (like canned or frozen corn kernels). Of course the salsa is the best made with the freshest ingredients possible. If you haven't cut corn off of the cob to use raw in a salad or salsa, you've missed out terribly! The gorgeous sweet corn from summer just begs to be eaten in any form possible. So, this is the "dreaded casserole!" For the story about the green bean casserole, see my post about Every Child's Favorite Mac 'n' Cheese recipe. Chelsea loves green beans and will even eat Swiss cheese, but just not together. 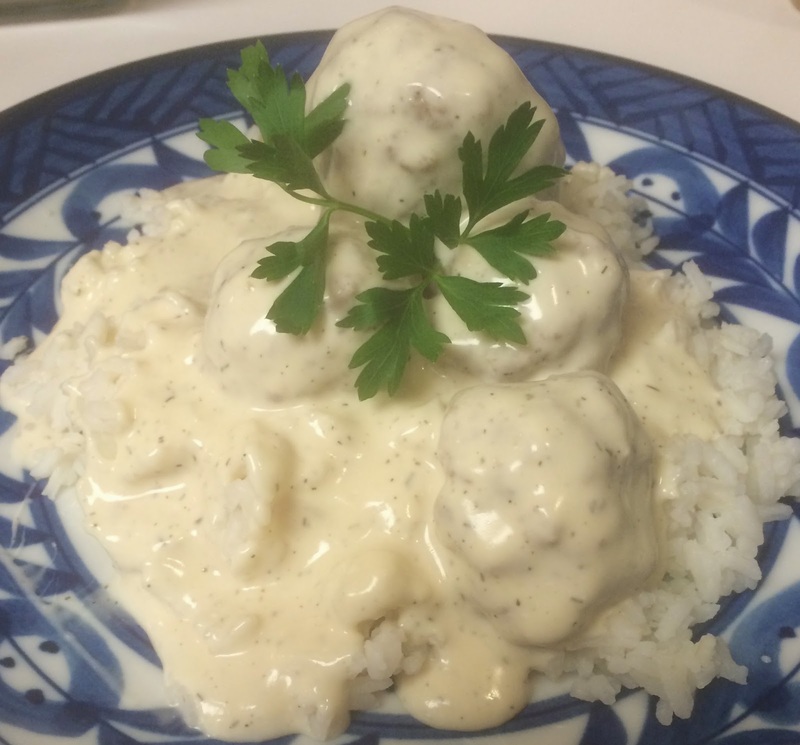 This dish has a creamy and slightly sweetened sour cream base that counters the tang of the Swiss cheese brilliantly. Add to that some tender shallots and a bit of black pepper, drained canned green beans (canned beans in this actually work and taste the best than any other form) baked to bubbling perfection. Then topped with your favorite brand of Swiss cheese (I use lite Alsace) and broiled until golden brown, oozy, and bubbly-crusty. To my family, there isn't any other way for cheese to be when it's cooked. We love those bits at the edges that are tender-crusty, and then again we love it when you take a portion of food and the gorgeous cheese pulls and strings from dish to dish! That's good eating right there! Fresh homemade mac 'n' cheese can and should be so much better than any boxed variety! Hook your kids (and yourselves) up on this simple pleasure that has a creamy delicious cheese sauce with soft but firm pasta. And guess what? It tastes like REAL cheese because it is! You can probably sneak in some secret "V". Let me whisper the dreaded word, (vegetables). I just happened to have a very large plethora of very ripe bananas. I usually freeze them as they get past the point where the three of us like them. We'll only eat them if they are green tinged around the edges. This gives a clean, fresh and firm banana, not soft, bruised or mushy. The latter description is apparently how the Polynesians used to like them. Insert a nasty, tongue-sticking-out face here ☟. Mexican Meatball Soup is a family favorite. Today however, I write this recipe for you with a heavy heart. My brother Dave, passed away just this past Tuesday March 4, 2014 of surgical complications. He was only 59. I absolutely love Scottish shortbread! It's buttery, very lightly sweetened, and tenderly-crisp. I 've formed them into triangles, medium sized galettes as shown, 1" round buttons sandwiched with a fabulous frosting, the base for all of my Streusel Bars, plus the buttery-moist and sandy topping for bars, and added all kinds of things to the batter itself. I even made them into cutout "spoons"
I have two very good, no, great tasting sugar cookie recipes to share with you. This first one today is an adaptation from a recipe on the back of a sugar bag. I think they look like big polka-dots. Or as my youngest daughter Chelsea called them when she was little - Po Po Dops! Down to the last morsels of deliciousness! I knew I'd better get my last piece with the last of the blackberry coulis or all would be gone! I did forgo with a fork in order to stick each loving morsel of cake into the bowl and scoop up some beautiful fresh blackberry goodness, which I gladly licked off of my fingers. This is such a beautiful cake, it rises very high and is perfect plain or topped with fresh blackberry coulis, and of course everything else, like chocolate! It's very tender and light, has a beautiful fragrance and amazing flavor. I can guarantee that you could serve this as "regular" Angel Food Cake, no one will be able to tell that it's gluten free! I promise! Every year about this time means that I reap an enormous windfall of fresh lemons, and I am soooo grateful to receive these beautiful blessings! Thank you Joyce! There's a small variety involved with these oranically grown beauties, some are small and round, some more pointedly oblong and medium size, and then there are my favorites; gorgeous monster sized Meyers. These Meyers are absolutely massive, and each has the potential of giving at least 1/2 cup of juice. At least! I always make lemon curd. My son and my husband love these tarts. If you are a lover of lemon and coconut then these are for you! The topping is just the right sweet-tart and so creamy, flecked with tender strands of sweetened shredded coconut. And the crust? My buttery-rich Gluten Free Scottish Shortbread crust is the ultimate compliment to the creamy filling. I just know that you're going to love them! The Best Cornbread - Ever! 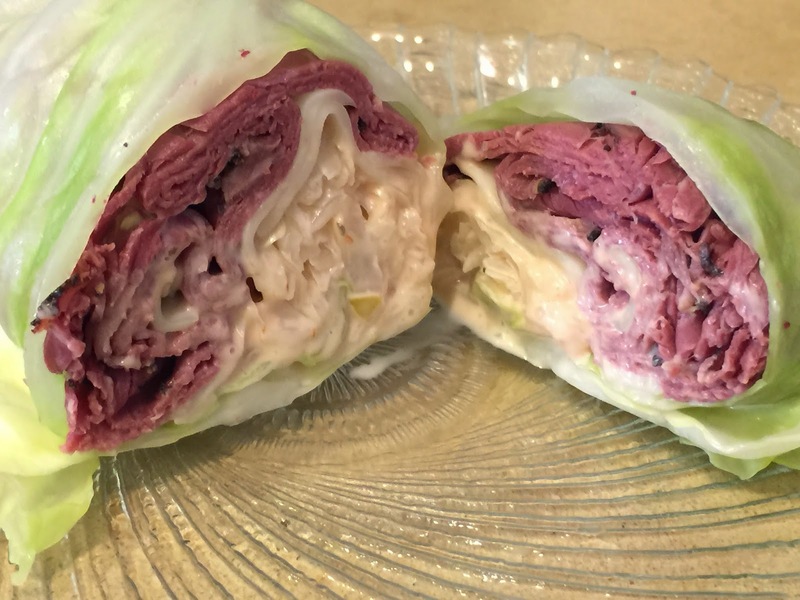 it's holding together beautifully, and the flavor is phenomenally good! I love good cornbread. I like it tender and moist, savory with maybe just the barest hint of sweet, and a bit of saltiness, and I love to slather it with fresh butter and gorgeous golden locally sustained bee-keeper's honey. Do you ever wonder how many families still have "Sunday Dinners"? Unfortunately it's probably way, way less than we could even speculate. Families are so torn apart by so many to-dos on their lists. We always tried to have dinners together whether at home, a restaurant, church, school, while driving, or with family or friends. There were many, many times that we took a "picnic" in the car to eat while on the road to another event of some kind. My Grandfather "Buster" Wells ranched about 80 thousand acres for the Irvine Company of Southern California, back when I was in Elementary School. Quite a bit of it bordered along the the outside of the MCAS "H" Base where the enormous hangers are still located. Of course the base is closed but it's still interesting to me and I'm sure many others in this area, that those are a major landmark. You can figure your way just by seeing them. I have been craving really good seafood lately. My hubby Greg took the three of us to lunch yesterday to nice little Italian restaurant called Nello's. Christopher had the Chicken Paillard served with Baby Greens with a Lemon Dressing, Greg had Blackened Swordfish with a Salsa Mix on top served with Roasted Vegetables, and then me? Ohhh, I had Calamari Steaks with Gluten Free Pasta - all lightly dressed with a piquant Lemon, Garlic, Caper Sauce. I was in heaven! Join by Email? Yes Please! Copyright by The CrossRoads Baker. Watermark theme. Powered by Blogger.